Chocolate Chip Cookie Dough Dip. Need I say more? Oh, and it’s pretty darn healthy too. Uh huh. How can that be, you ask? Chickpeas is the answer. Magical, wonderful, neutral-tasting chickpeas. This healthy snack is vegan, gluten-free, refined sugar free, and can also be nut-free. Your kids will ask you for this every single day, and you can happily give it to them. They won’t believe you’re letting them eat cookie dough for a snack everyday, and you will win the “Parent of the Year” award. Congratulations! 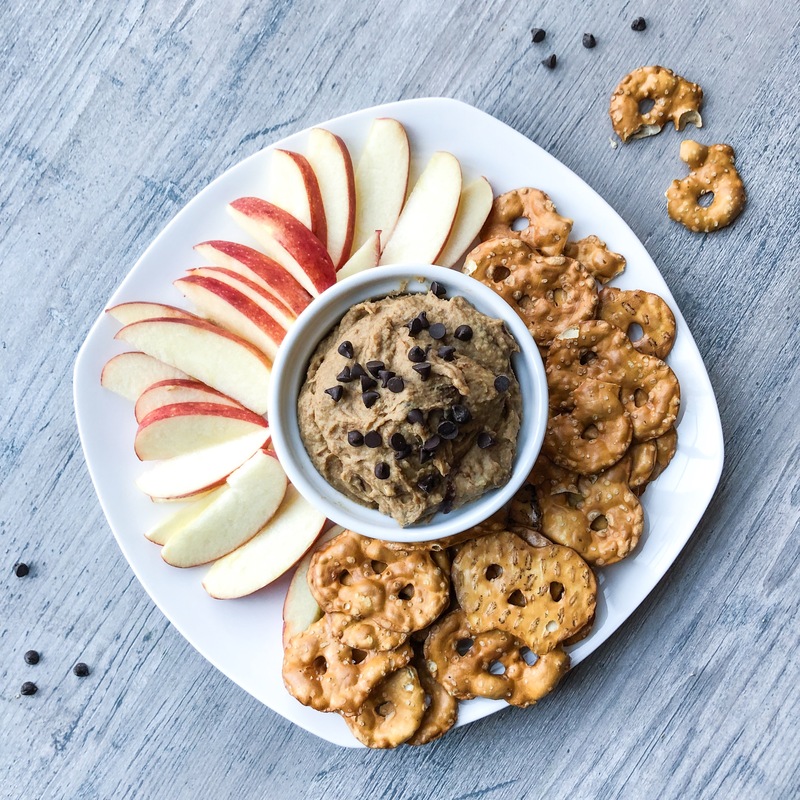 Chocolate chip cookie dough dip is made with just seven simple ingredients: chickpeas, dates, salt, oats, vanilla, seed or nut butter and chocolate chips. The oats are optional, but do add some texture to the dip. If you’re avoiding grains, then you can simply omit the oats. You don’t need much forethought when making this, but the one thing you’ll have to do ahead is soak the dates in hot water for 10 minutes to soften them up. Save that soaking water, because you may need to add it to the food processor to help with the blending. Next, throw everything except the chocolate chips in the food processor and let it whirl! Scrape down the sides a couple times throughout blending. Add some of the soaking water from the dates a tablespoon at a time if it’s having trouble blending. Process until the mixture is smooth and creamy. This will be wetter than a traditional cookie dough, but that’s what you want, because it’s a dip afterall! Scrape the mixture into a bowl. The mixture will be warm from the dates and cooking water. You can add chocolate chips now, but they may melt slightly. Or allow to cool and add chocolate chips later, your call! Stir to combine. You can eat this dip right away, or put it in a covered container in the fridge and eat it chilled. Either way won’t let you down. 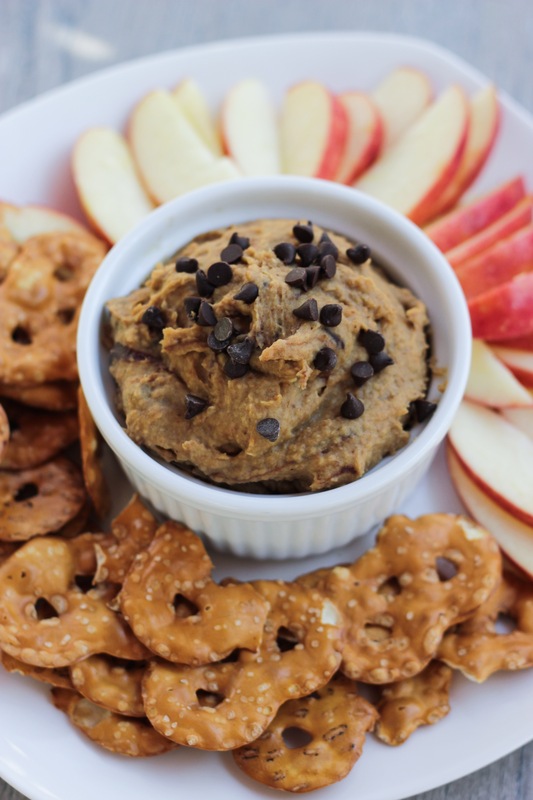 I like to eat this dip with apples or gluten-free pretzels. Oh, the pretzels…sweet and salty…heaven. Graham crackers are another popular choice, but mostly my kids just eat it right out of a bowl with a spoon. But they still call it dip. Kids. Hey, guess what? I made my first video! You can see it below..it shows you just how easy this dip is to make. I hope you enjoy it! 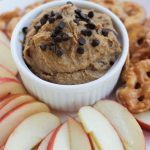 Chocolate Chip Cookie Dough Dip is made from chickpeas and is vegan, gluten-free and refined-sugar free. This is a quick and delicious snack that everyone in your house will enjoy! Cover the dates with water in a small sauce pan and simmer for 5 minutes. Drain, reserving the cooking water. Add dates, chickpeas, vanilla, salt, nut butter and oats to the bowl of a food processor. Process for 3-5 minutes, adding reserved cooking water as necessary to help blend. Process until very smooth and creamy, scraping down the sides once or twice. Scrape the mixture into a bowl. The mixture will be warm from the dates and cooking water. You can add chocolate chips now, but they may melt slightly. Or allow to cool and add chocolate chips, your call! Stir to combine. You can eat this dip right away, or put it in a covered container in the fridge and eat it chilled. Serve with apples, graham crackers, pretzels, or eat straight from the bowl like my kids do! Enjoy! . Use sunflower seed butter for a nut-free version. I have used peanut butter, almond butter and sunflower seed butter in this recipe, and all are delicious. Each changes the flavor slightly, so play around. This is such a great use for chickpeas Maggie! And I love that you used dates instead of sugar-so much fiber!! The kids are going to LOVE this one!! I’m glad you like it! It really is a fun recipe for the kids! Enjoy! Great job on the video, Maggie! Thank you Lyndsay! It was fun to make!